Extra-Large ~2.5kg pack treats 1000kg coarse grain. Cropping Groups include seed adhesive (50ha/carton). Sufficient inoculant for 10L of slurry. Extra-Large packs may also be referred to as a Mega packs or tonne packs. Large ~1.25kg pack treats 500kg coarse grain. Sufficient inoculant for 5L of slurry. Large packs may also be referred to as a Jumbo pack or ½ tonne packs. Small ~0.25kg pack treats 25-50kg. Requires additional seed adhesive (StickATM) to pellet seed. 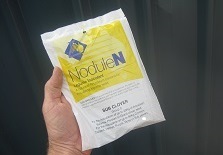 Sufficient inoculant for 1L of slurry. Small pack may also be referred to as a Standard pack. Product storage, keep refrigerated before application and cool/ high humidity post application to seed. Sow treated seed within 24 hours of application to seed, ideally within 5 hours. The use of StickATM seed adhesive will help protect the inoculant from drying out and perishing. This is of greater importance with smaller seeded pasture species that are sown closer to the surface.